Today it's time for Ten on the 10th! This is a gathering of friends who are doing projects, cooking meals, crafting, beautifying, and doing all kinds of things for $10 or less. I love this group of ladies who embrace the fact that we don't have to spend a fortune to create something wonderful. For this month's fall theme, I embraced my pre-Pinterest self and made a no-sew table runner. Do you ever wonder if Pinterest kills confidence? I think it might. Here's a memory for you. Years ago when I moved out for the first time, I lived in a little house without window coverings in the bedroom. It never crossed my mind that this was a challenge I couldn't overcome. I went right on up to the dime store and bought yards of muslin and iron on tape to make my own super cute curtains. There was no hesitation and no doubt in my mind that I could accomplish this. However, these days we have so many visual images of perfection that for me, my confidence is sometimes crushed before I start. Anybody else? So as I considered this month's Ten on the 10th challenge, I knew that although I loved my Candles, Cloches, and Cake Plates tablescape, it needed little something soft. I've been cleaning out closets and ran across a pair of curtains that go back to a decorating mistake made a few years ago. The curtains have been folded in the closet since then (for probably 5 years) just waiting to see the light of day! 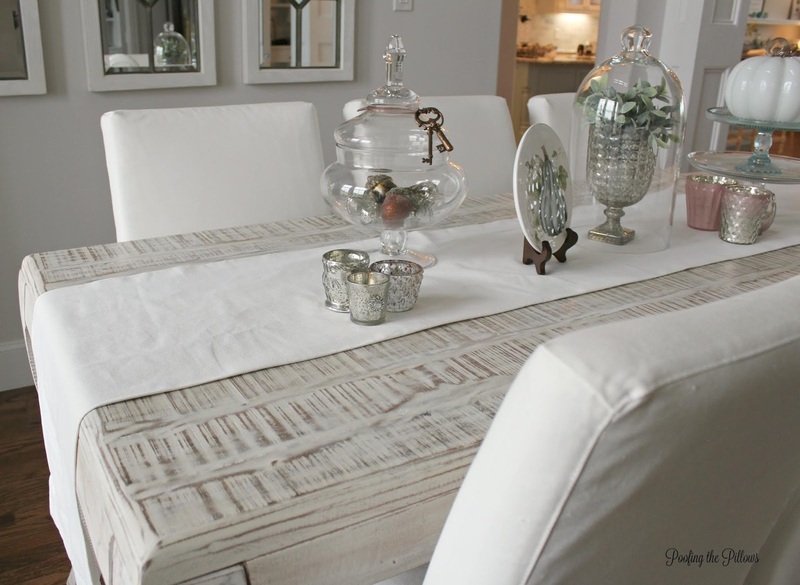 When I found them I knew the beautiful white linen material would make the perfect table runner. However, this girl doesn't know how to thread the sewing machine. What would any pre-Pinterest creative do? Iron on seam tape and a hot glue gun to the rescue. Amen! With my pre-Pinterest skills, I cut a 17" strip of the curtains. To cheat even more, I used the hem that was sewn into the curtains on one side and then used iron-on seam tape to create the seam on the other side. The table runner made the setting look so much more complete but I thought it needed a little something more. Details make all the difference, you know. 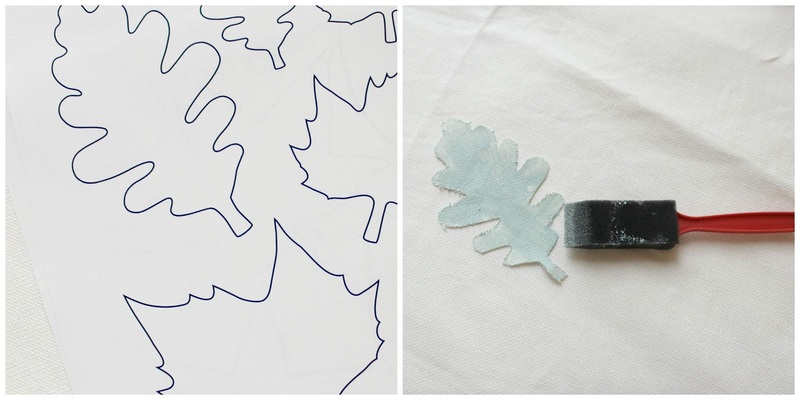 I Googled a leaf pattern, traced them onto the fabric, and then cut out leaves. This was fun! While listening to the Commodores, I used just a smidge of the Sherwin Williams Watery paint that is on the inside of our front door and on the kitchen island to dry brush the leaves. With a dot of hot glue, they are attached and I love them! There is no perfection here with this project but there is satisfaction and smiling at the outcome. I would imagine that crafting came about from necessity somewhere in time. Wouldn't you? I'm pretty sure I remember my mom making a purse for me once out of an oatmeal box. Would that be on Pinterest? It should be! Thank you for stopping by today. This month we are welcoming Ricki Jill of The Sketchy Reader to our group. Please be sure to visit all the Ten on the 10th participants as they share fabulous fall ideas for $10 or less. A perfect "recycling" project from your own stash of supplies!! Your dining room is so pretty and your decor so delicate!! Great idea for under "10"! I love your table runner. Even though I sew, I would have definitely used the hemmed side of the curtains! Smart girl. The painted leaves add just the right touch of color and softness. I'm so proud of you!! It looks perfect on your table as a foundation for your pretty pieces. 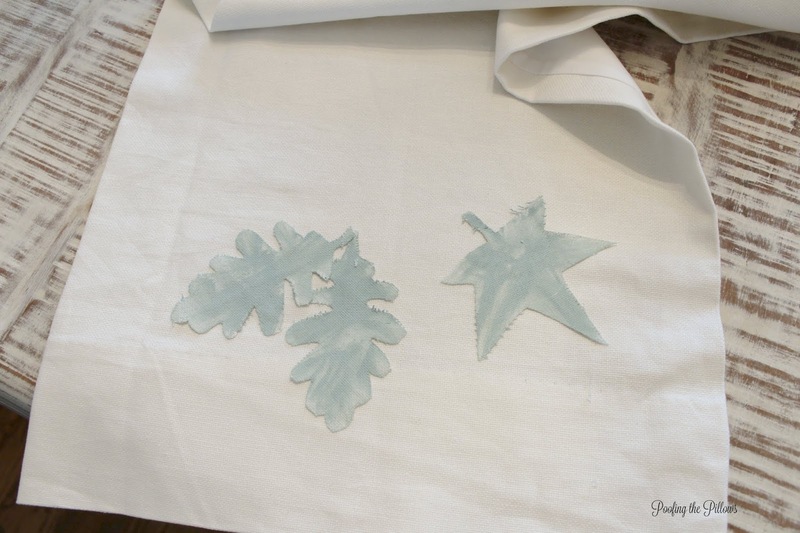 Do you have enough curtain fabric left over for pillows or placemats? Don't let it go to waste! Thanks so much for hosting!!! The leaves added a lot to the runner. I need a new Fall runner and should do something easy like this! I always love your classic decor! Hugs! This is adorable. Worthy of Pinterest in my opinion. I love the turquoise leaves. They are perfect for your decor. I love your runner! So pretty!!! I have a plain runner in my stash that I think needs a few fall leaves. Thanks so much for the inspiration. It is always more rewarding and fun to use stuff you already have. Love the leaves and the color. Very pretty. That turned out wonderful! I love the added leaves. Wow, I love your table runner. 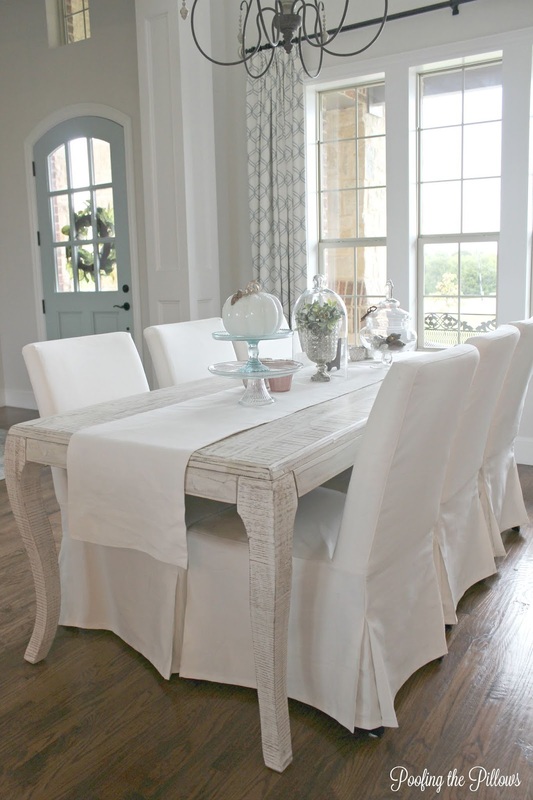 It looks perfect in your dining room! If you have any fabric left over from the drapes you should make more runners for other holidays! I can't sew, either! I don't even sew buttons on....that's Trip's job! So it's nice to know that those of us who are sewing challenged can make pretty things without sewing! So clever, so simple, so pretty! Stacey, you are amazing!! This one is right up my alley...easy, inexpensive and elegant! It looks perfect in your room...Fabulous and so totally fall!! 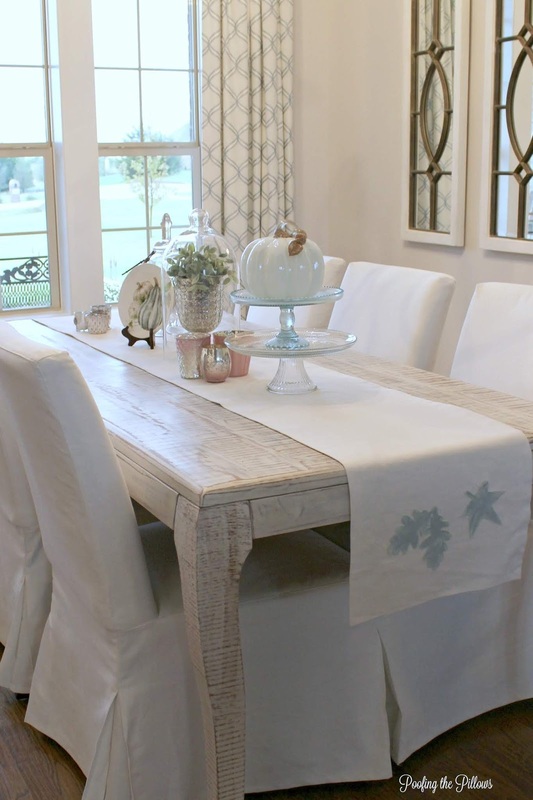 Hi Stacey, the runner you made is perfect on your dining room table. I love the way you decorated it! Yay for being creative. Have a nice week. Great job! I don't know the first thing about sewing either. Can't even sew on a button, lol! But that's what iron on seam tape is for, right? :) Love the little leaves you added too. No sew - Woo Hoo! I think it turned out beautifully Stacey! I need to do one for everyday. I was thinking a Thanksgiving runner but then I remembered before that even gets here I'll be decorated for Christmas. Ugh! Do you do that? Decorate for Christmas before Thanksgiving? I never did until becoming a blogger. Love it! You did a great job! I'm very intimidated by projects because my skill level is not that great. Even when it looks easy, I feel like I can't do it! This is so pretty, Stacey...absolutely perfect to me! Love the runner and the leaves,oh my!! Very pretty. It seems like since I hardly ever sew anymore, when I do, I spend more time fighting with the sewing machine and ripping out mistakes than sewing. I think I'm going to buy that no sew tape! I would love to see how you can make a purse out of an oatmeal box! Put that on Pinterest. Seriously, your table runner came out beautifully and I love how you reused your old curtains. I'm all about reusing old fabrics into something else! You made something pretty and you were green about it too! I LOVE it so much!! Subtle and Fall Fabulous!! You're sooo good! Your table runner is beautiful and I love the addition of the leaves! I agree that Pinterest images can be discouraging. Love your idea! I love the runner and the leaves. Who would have known if you didn't share with us ? I can so relate to Eilis's comment. Haven't sewn in years because of the fight. Last year I discovered Fabri-Tac when making hair bows. Works really well. Just lovely. I think you invented the all season table runner for under $10! Just pull off the leaves and add something gold and shiny for Christmas, then on to Valentines... Love this idea!